Here's a happy set of five products I've used every single day this week for a work safe look which can easily be converted for glam nights. NARS Sheer Glow Foundation provides an excellent photogenic base (just incase the paparazzi managed to find me.. I kid), but it is a wonderful foundation for springtime with fluctuating hot and chilly temperatures. 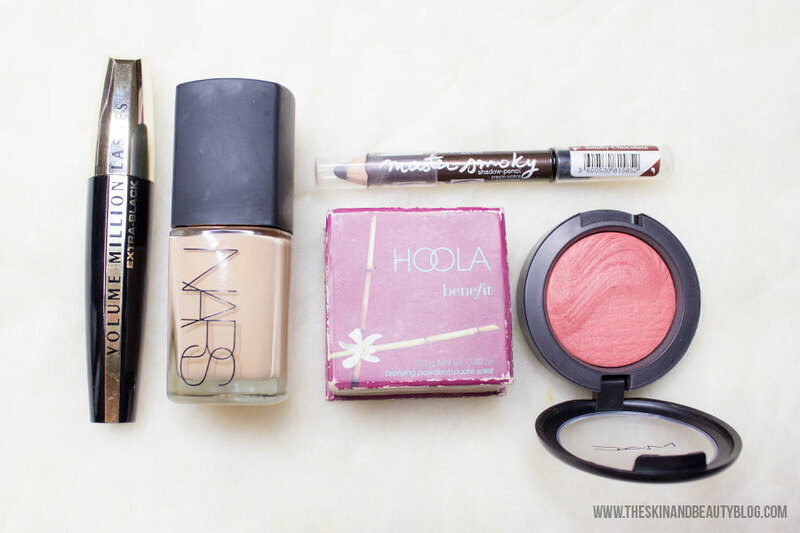 Benefit Hoola Bronzer has been my staple contour product for years and is of course a favourite. For day time use, I tightlined my eyes with Maybelline Master Smokey Chocolate Eye Pencil and for night, I applied this all around the eyes on the top and lower lashes smoked with the rubber smudger tip. Eyelashes coated with L'oreal Volume Million Lashes in Extra Black with as many layers as desired. This is excellent for volumising and separating the wispies. For my cheeks, I've somehow been magnetized to the MAC Autoerotique Blush since I picked it up last January as its versatile for different outfits. Now care to share, what products have you used regularly this week? I'd love to hear your favourite things! How would you compare this to a shiseido curler? that's my go-to right now. I remember when eyeko was all about their beauty cream hehe I see they got a brand makeover and are focusing more on eye products, I haven't tried their new products yet, but their mascara back in the day was actually pretty, good, Thank you for the review, hoping to try this soon. BTW love that you're a doctor! I still very much prefer shiseido!